Life's Journey To Perfection: 2016 LDS Sharing Time Ideas for October Week 4: Heavenly Father hears and answers my prayers month review. October Week 4 Topic: Heavenly Father hears and answers my prayers. Since this week's topic is the same as week 3, I thought it would be fun to do a review of the whole month for this week. It will give the primary children an opportunity to really participate and to share their own experiences and testimonies of prayer. Begin sharing time by placing the three week theme posters on the board. 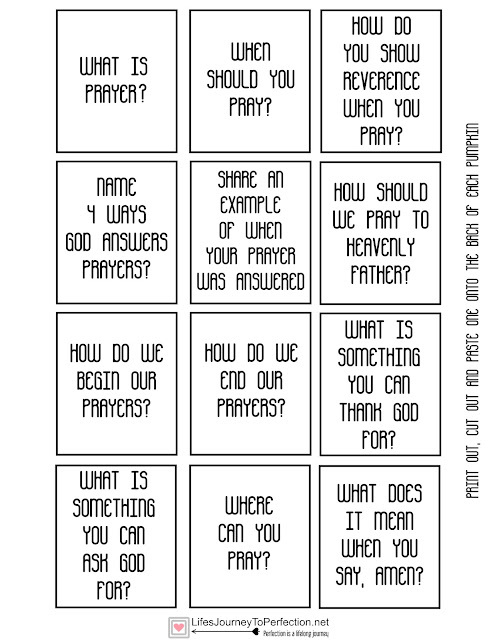 Explain to the primary children that this month in primary we have been learning all about prayer. 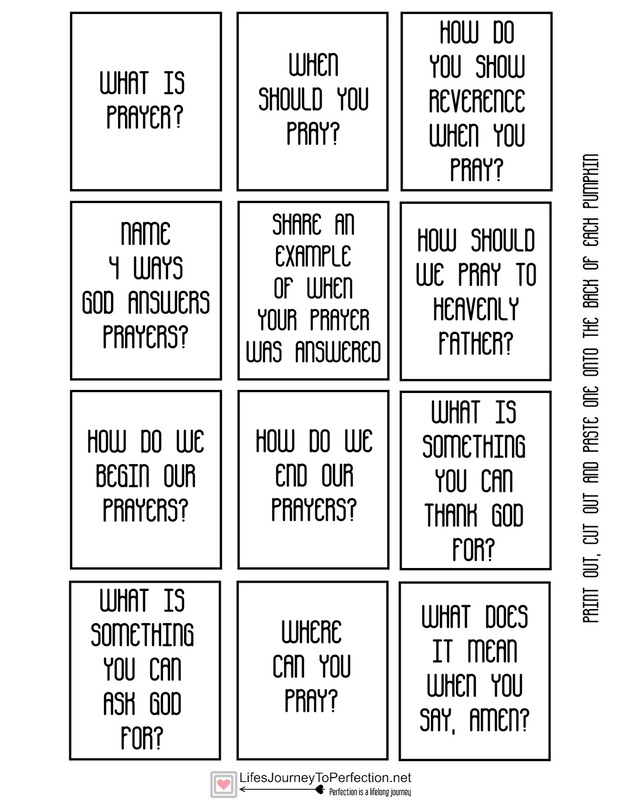 Further explain that today for sharing time they are going to see what they know about prayer. Say the phrase on each poster with the primary children. Invite the first primary child to come up and pick a pumpkin. Read the question and invite the primary to answer that question. Expand and Explain if there needs and further discussion on it. Invite another primary children to come up and pick a pumpkin, continue until the pumpkins are gone or time runs out. Express your gratitude for prayer and desire for the primary children to always remember that they can pray to their Heavenly Father, at anytime, anywhere, about anything! What is Prayer? Prayer is reverent communication with our Heavenly Father. When Should You Pray? We should pray always. We can always have a prayer in our hearts. We can pray in private or in a group. We pray over our food. We pray in the morning and at night and with our families. How do you Show Reverence when you Pray? We bow our heads, close our eyes and fold our arms. We speak reverently to our Heavenly Father as we speak to him. Name 4 ways God answers Prayers? In our Heart and Mind, answers can come as we read our scriptures, they can come as we listen to the words of prophets, and they can come by way of another. Share an example of when a prayer was answered. Let as many children as would like to share, share their experience. This is my favorite part, listening to them share their testimonies of prayer. If they have a hard time coming up with something share an example you had and it will get them thinking and sharing. 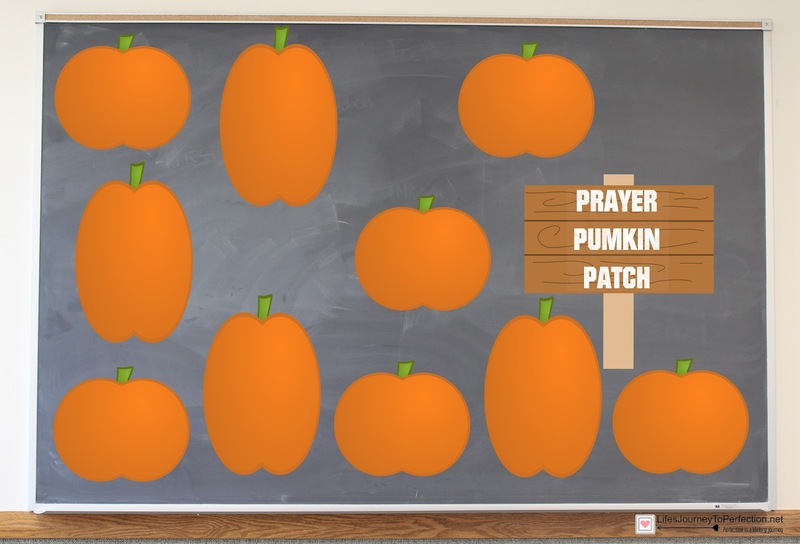 How should we pray to Heavenly Father? We should pray reverently to Heavenly Father. How do we begin our prayers? We begin our prayers by addressing our Heavenly Father. We say something like, "Dear Heavenly Father, "
How do we end our prayers? We end our prayers in Jesus' name. We say, "In the name of Jesus Christ, amen". What is something you could thank God for? Allow the children to share their answers. Where can you pray? ANYWHERE! What does it mean when you say, amen? When we say amen, we are closing our pray. And when wen say amen after a group prayer, then we are saying that we agree with everything that was said during the prayer. See the previous weeks sharing time ideas and the "Ultimate" List of Primary Ideas for even more ideas! Great Idea! This is cute and the kids will love it. Thanks!! Thank you so much for sharing your ideas!!! I love the pumpkin patch concept...tis the season! Thank you for sharing your super fun ideas!